Rising high above the Fraser Valley Winter Park Resort stretches across 3,081 acres of skiable terrain making it the fourth largest resort in Colorado and placing it among the big dogs of North America but it is more than just its expansive size that draws thousands of visitors at year up and over Berthoud Pass. It is a common refrain from many who call Winter Park their “home” mountain. From eccentric characters like the Mayor of Mary Jane to the stalwarts of the skiing industry who have long called Grand County their home Winter Park Resort tends to draw folks who put love of skiing, or snowboarding, above self image. That stripped down mentality, focusing on function over form, has created a culture of locals and regulars that prizes the fun of a good powder run above almost anything else. But culture alone is not what brings the crowds from Denver. For that Winter Park Resort relies on a collection of factors ranging from affordability to snowfall. “On the surface, the biggest draws are our great snow, our expansive terrain, and other amenities like our Village and the Winter Park Express train,” Hurlbert stated. Winter Park Resort has averaged 323 inches of snowfall per season over the past 10 years and while it may not get as much snow as some of the remote resorts of the southern San Juans the mountain is well known for its March and April powder dumps when late spring storms often deposit a foot or more of fresh snow. The Resort is also famous for its mogul runs and tree skiing, especially in the Mary Jane Territory. Other major draws for Winter Park Resort include its close proximity to Denver and the broader Front Range population centers. 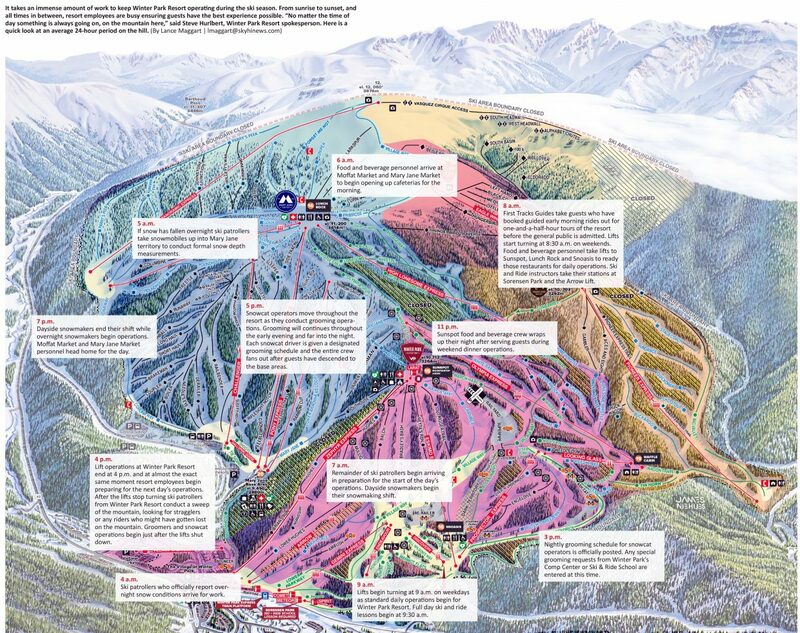 Located roughly 66 miles from downtown Denver Winter Park Resort is the third closest ski resort to the state’s capital, with only Eldora outside of Nederland and the diminutive Echo Mountain being closer, though Denver residents will find little difference in drive times between Winter Park and Eldora. Winter Park’s advantageous position right beside the Union Pacific Railroad track running through Grand County also offers a truly unique opportunity for riders in the form of the Winter Park Express. As such Winter Park Resort is the only ski resort in North American that offers slope side access from a train. Those factors were highlighted by Viking Lodge owner and Middle Park High alpine ski coach Scott Sutcliffe who explained the draw of Winter Park Resort in two words, “accessibility” and “affordability”. Sutcliffe went on to highlight Winter Park Resort’s terrain variations and small weekday crowd sizes as big factors and also noted that the Resort and visitor accommodations throughout the county are much more reasonably priced than many other resort communities across the state. For Hurlbert and Winter Park Resort though it all circles back to the people who make it all possible. “The quality of the people who work and live here will always be what sets Winter Park apart from other resorts,” he stated.